Worked most of the day yesterday in my room on my talks for the Thrive Conference coming up this weekend at Shanghai Community Fellowship. They put together a cool little promo video for the conference here. Earlier this week, went to this restaurant, right behind my hotel. 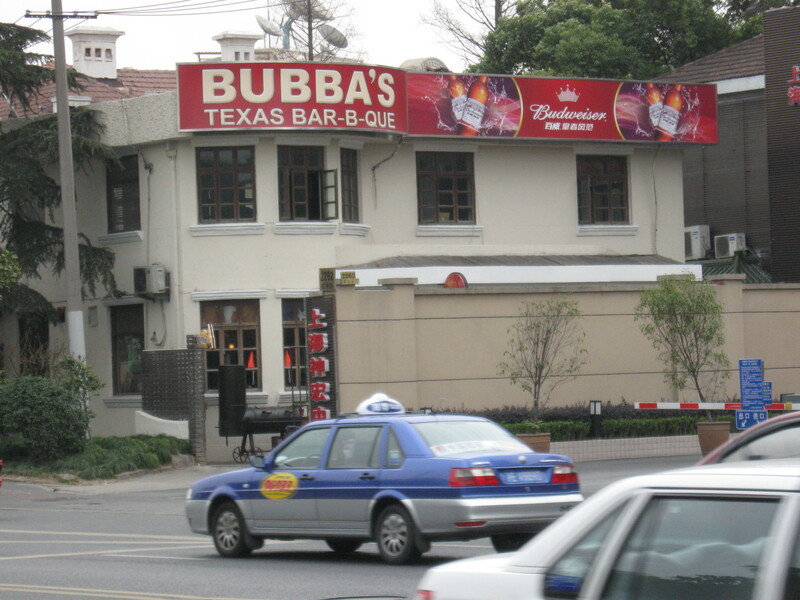 Real guy named Bubba from Austin, TX owns it. I had a blast jiving with Bubba. He’s the real deal, like Larry the Cable Guy. Surprisingly great BBQ. Had a pulled pork sandwich, slaw on top, of course. Sweet tea and real BBQ beans, not the kind you have at a picnic. Real cowboy beans. Had two bowls, no residual effects. Then out on a walk after the BBQ feast, saw this sign. Folks, things like this is why Focus on the Family has so much work to do across the world!! I got involved quickly, had a nice little intervention with the family and they will be changing the sign this week to “Super Happy God-Honoring Family” this weekend. No seriously, you see lots of funny signs here with curious translations. This “Naughty Family” sign was pointing you to what looked like a dog-park. Another sign I saw yesterday was over a low over-hang on the escalator encouraging you to “Mind Your Head!” Always a good idea!